So anyone who has been reading the last few blogs will see I've been slowly ticking off one or two beers off from “1001 Beers...” at a time. Having now racked up 160 beers from the list, it's starting to get a bit more difficult. However, a few days off gave me the chance to get in trips to the Vineyard and Lighthouse Wines. It's good that they both have a slightly different selection of beers, and that gives us beer geeks a chance to sample many more beers. Importantly, both have friendly and knowledgeable staff. If you're into beer or just want to try something new or interesting give either (or both) a try! So here comes the beers. 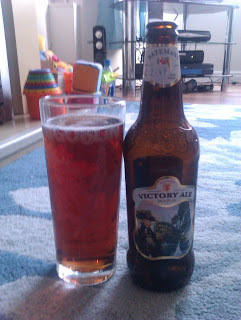 Batemans Victory Ale. Style: Premium Bitter, ABV: 6%. Description: Poured dark copper. Dark fruit aromas, heavy and malty. Biscuit malts, toasted flavour, with a slight sweetness. Medium body, on slight fizz. Thoughts: I have said before bitter (even a premium bitter or ESB) isn't my favourite style. But this was pretty solid and drinkable. The 6% ABV added a nice boozy heat that carried the sweet, caramel malts quite well. One of my favourites of the style. Timmermans Framboise Lambic. Style: Fruit Beer, ABV: 4%. Description: Poured dark red with no head. Strong raspberry smell (well what else would you expect?). Fruit raspberry taste, but a sour finish thanks to wild yeast. Light mouth feel, not too fizzy. 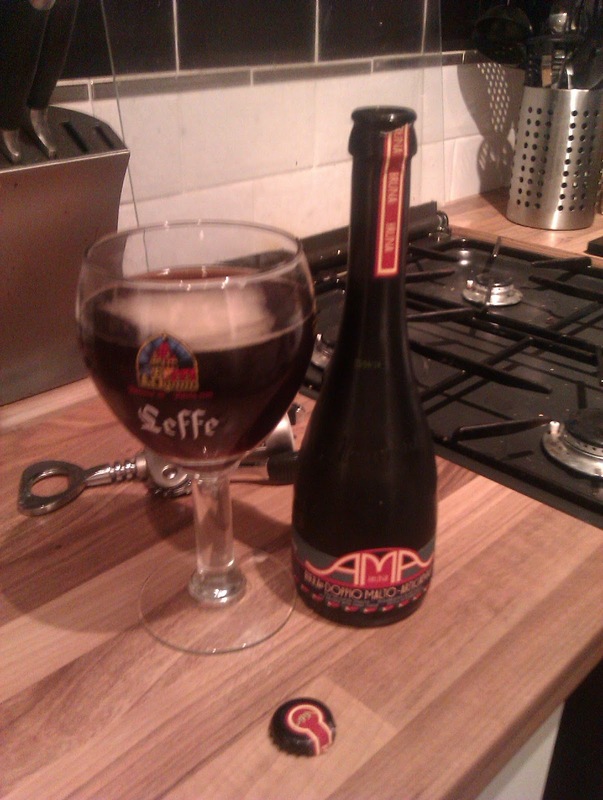 Thoughts: This technically isn't a new beer to tick off as I've had it before (thus why it's number 52), but I fancied a fruit beer and hadn't blogged about this one before. I guess fruit beers can be a bit of an acquired taste. Done badly they can be an overly sweet mess (see the next beer in this blog! ); done well they can be a delight. This one is a middling example, strong raspberry flavours, but as it's a lambic (wild yeast) – there is a yeasty sourness to the finish that keeps it dry, balanced, and refreshing. Nice wee beer that’s not too high in alcohol. Timmermans Peche Lambic. Style: Fruit Beer, ABV: 4%. Description: Slightly golden more than pure peach in colour. Strong fruit aroma (a bit like peach snapps). Strong fruit flavour, lots of sweetness. Light carbonisation. Thoughts: A saw this when buying the raspberry beer above and thought, “what the hell – lets give this a go”. To my palette, peach and beer is probably not a great combination, far too sweet, and no real sourness to make it balanced. Not undrinkable (clearly, as I still managed to finished it...) but not something I’ll be buying again. 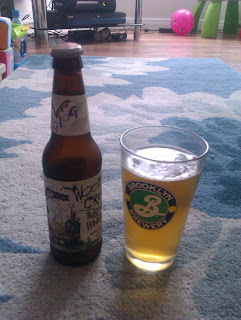 Flying Dog Woody Creek Belgian Style White. Style: Wheat Beer Ale, ABV: 4.7%. Description: Poured blond and slightly cloudy. A little head that led to some lacing. Coriander and orange aroma. Spicy wheat flavours, slightly “chalky” sensation. Just a little fizz. Thoughts: May be it's because this followed the peche, but I really enjoyed this. This is what Blue Moon should be, a nice example of the style with plenty of spicy flavours, a little bit of orange zest, and a slightly dry finish. 4.7% makes it drinkable too! Another beer I like from Flying Dog. Amacord Bruna. Style: Dubbel, ABV: 7.5%. Description: Poured dark brown, with a little white head. Very little lacing. Toasted malt and caramel aromas. Quite a sweet taste, that hides the 7.5% ABV. Little fizz. . Thoughts: The second of this range of Italian beers designed by Brooklyn Beer's Garret Oliver. I can see what they were trying to do here; a subtle malt beer that goes with food. However, while the Blonda worked quite well, I think the added brown candy sugar gave this just too much sweetness. It makes it very light for 7.5% but not that well balanced (more bitterness or toasted malt would help). Drinkable, just not great, though I’d guess this would go well with a dessert. There is more to come, from both on and off "1001 Beers...", from my recent purchases. Therefore, the second post of this series will follow soon! There will also be a little beer rant on my visit to the, otherwise wonderful, Slieve Donard Hotel.